It’s easy sometimes to get caught up in the many aspects of cigar enthusiasm, from whether the industry’s largest trade group should initiate a consumer day, to which shop has the latest limited release, to the new, hot blender. Do you age your sticks? Cello on or cello off? What’s the best bundle? Is your humidity at 60 or 65 or 70? 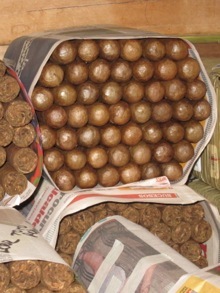 I know it’s Nicaraguan tobacco, but what region of Nicaragua is it from? Do you think stalk-curing is the next big thing? Have you seen this stick I got at event last week? The questions, and the answers, can be endless. And a lot of fun. Part of what makes a hobby enjoyable is the ability to become immersed in the culture and all its arcana. But sometimes we can become lost—or at least I can, speaking for myself—in a thicket and miss that bright blue sky overhead. This came home to me the other day when I was reading a column in the February Stereophile, one of many magazines I enjoy despite not even remotely understanding what much of the writing is about. The interesting thing is how often I’m reminded of cigars. For example, Jason Victor Serinus described a demonstration he’d produced for an audiophile gathering to evaluate two speaker cables. Serinus was confused by numerous listeners who either could tell no difference or preferred the lower-priced cable sound. Needless to say, I thought of cigars and my own cigar reviews as I was reading. I used to be in the high-end audio cable business. I began to feel sorry for the people who were so caught up in the details of their equipment that they missed the emotional impact of the music. They worried so much about having the absolute latest and best equipment, they seemed to miss the whole experience. When you compare cables and interconnects side-by-side, you can discern differences, and you may find one preferable to your particular ear. At some point, though, you need to sit back and enjoy the performance, not focus on some nuance that you think you might be missing. The same thing clearly applies to cigars. They're supposed to be enjoyed, not critiqued to death. That was well put, thanks.